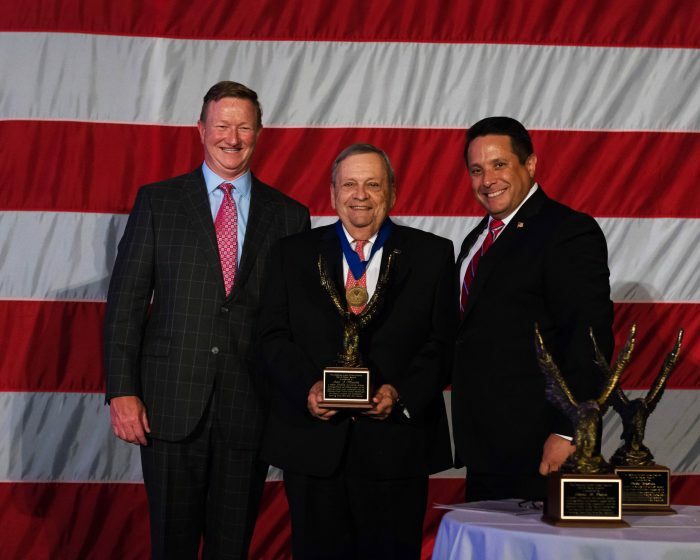 HANSCOM AFB, MA (August 17, 2018) — Paul Marotta, Hanscom Federal Credit Union’s Chairman of the Board, was inducted into the Defense Credit Union Council (DCUC) Hall of Honor during the DCUC Annual Conference held this month in Williamsburg, VA.
Marotta has served Hanscom FCU and the credit union community with distinction since 1976. He first served on Hanscom FCU’s Supervisory Committee, and then served as a Director beginning in 1988 until he was elected Chairman of the Board in 1992. Marotta sets precedent for the active board involvement and member volunteerism that has kept Hanscom FCU true to traditional credit union values. During his nearly 45 years of service to the credit union, he guided Hanscom FCU through some challenging times, including rapid developments in technology, unprecedented member growth, economic ups and downs, and some of the greatest legislative hurdles the credit union movement has seen. Under his leadership, Hanscom FCU’s assets have grown past $1 billion and the branch network has grown to 21 locations in two states. Marotta has also demonstrated a high level of social responsibility in his role as Hanscom FCU’s Chairman. He’s an avid supporter of Home Base, a partnership of the Red Sox Foundation and Massachusetts General Hospital; Boston Children’s Hospital; and the Massachusetts Coalition for the Homeless, as well as numerous outreach efforts that enrich local and military communities. For the past 15 years, he’s served as the only volunteer official on the Social Responsibility Committee of the Massachusetts Cooperative Credit Union Association. He became chairman of this committee in 2016. DCUC’s Hall of Honor was established in 2000 as a means of recognizing individuals whose contributions and inordinate support of the credit union movement added great value to the Defense Credit Union Council and defense credit union community. Former or current volunteers, and management and staff of DCUC member credit unions, whose lifelong achievements have been exceptionally noteworthy, are eligible for this prestigious award. Hanscom Federal Credit Union’s Chairman of the Board Paul Marotta (center) receiving his DCUC Hall of Honor statue from Frank Padak, President & CEO of Scott Credit Union (left) and Anthony Hernandez, President and CEO of the Defense Credit Union Council (right).